We eat the rest of the baguette with ham and cheese from yesterday while Katja’s proofread a few blog post and publish them. Then we’re out the door and on our way to meet Leaitisia down at the Marina Bay Sands hotel. It’s a spacey design of three towers with a big boat laying on top. It’s something out of a sci-fi movie. We meet up with Leaitisia at a coffee place where we start our planning. We have coffee, she has green tea. We start by going to the Garden by the bay that’s built on manually constructed land. There was only sea here before they extended the island manually. Not without reactions from Indonesia, which has it’s closest island just twenty minutes by ferry from here. The park is beautiful. It’s so nicely constructed and there’s a few really futuristic designs here. Super-trees of metal constructions slowly being covered by a diversity of trees and vines. 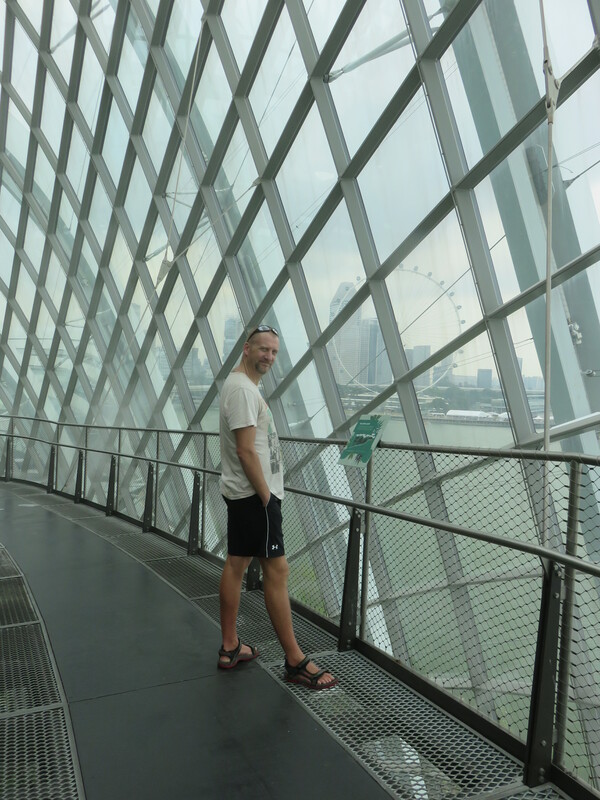 We paid five Singapore dollars and got up on a “tree” walk some twenty two meters above ground. After that we walked to the domes. There are two closed huge domes available as separate attractions. The first dome supposedly contains the world’s highest indoor waterfall. It’s nice, but it’s even nicer when you take the elevator to the sixth floor. From there you walk up to the seventh and find The Lost World. The atmosphere is “adjusted” to represent ca 2000 metres height and it’s sprayed with mist every two hours to represent the clouds normally at this elevation. There’s carnivore plants in the exhibit, and Lego is used to emphasise the plants. Very cool indeed. It’s cold though. Like really really cold. I’m shivering in my already sweaty t-shirt. We keep moving and hopefully I’ll avoid catching a cold. After walking down over sky-bridges. I include a picture here especially for Madam Family. You would have gotten your fill here, Mette. Down at the bottom level there’s a movie playing to warn us about the forthcoming disaster if the temperature rises five degrees, as predicted towards 2100. Hopefully we’ll manage the climate change before that. We move out of this pod and into the next. It’s a botanical garden with a lot of different cactuseses. Or is plural cacti? Anyway, there’s loads of different scenes and scenarios displayed. They play children’s music on the speakers and it’s similar to “It’s a small world after all” that will drive you crazy at a Disney world anywhere in the world. Can you spot the plants among the stones? We exit cold and hungry and go back to the Sands and a restaurant Leaitisia knows. It’s brilliant. Vegetarian and with great tastes and very fresh vegetables. I have falafel and it’s really good. And plentiful. I’m still stuffed four hours later. We say goodbye to Leaitisia and go for another coffee. Then we go to Raffles city in search of flan. A French vanilla cake. We do find it, Katja don’t like it and leave it to me to finish it. All the sacrifices I take for the team! We communicate with Morgane and agree what to shop for dinner and when we’ll meet up back home. We shop in the center we’re already in before moving out. I check of its possible to get to see the new Terminator movie while we’re here, but it doesn’t look good. There’s only late night showings. So we so the second best thing. First we take a look at Raffles hotel. Made famous for inventing the Singapore sling drink. Then we walk to the Ritz Carlton to look at their art. They have a collection supposedly valued at five million dollar. We are addressed by one of the employees and when I tell him we’re here to watch the art we get a little book with description of the art, location and a short biography of the artists. Very nice. We walk around and look and enjoy before it’s time to head home. It’s Friday and rush hour. It’s a lot more people on the public transportation systems, but I guess it’s still quicker than ride through the city in a taxi. We arrive back home at sundown and relax for a hour in front of the TV before Morgane is back from work. 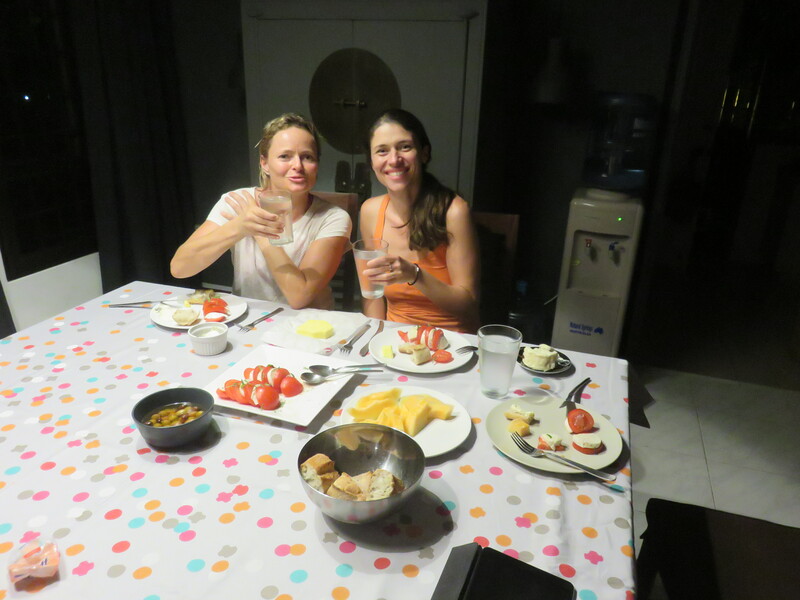 We have dinner with French cheese, tomato and mozzarella, baguettes and salty butter. It’s delicious. I Skype with my parents and help out with a pc problem or two before the night is over. Third night here in that house. Time really flies when you have fun.